RDS is a managed database service offered by AWS that runs MSSQL, MySQL, Oracle, and PostgreSQL. It’s a great alternative to configuring a whole database on instances and is optimal for smaller companies that don’t have a DBA. A key feature of RDS is the automated backup option that’s based on database transaction logs. It allows you to perform point-in-time recovery with a 35-day retention period. RDS also supports manual snapshots, which enable you to recover an entire database from a single snapshot. See the following three reasons for why using RDS manual snapshots is essential. Since RDS automated backups only provide a 35-day retention period, you can create manual snapshots if you want to keep the database backups longer. If you were following a set of compliance requirements, for example, you could opt to take snapshots at larger intervals since you also have the option to run automated backups for short term recovery. This allows you the added option to retain snapshots for much longer than 35 days. *Note- AWS limits the amount of manual snapshots you can take per account to 50 DB snapshots per account. If you have multiple databases, you might want to raise your snapshot limit. Contact AWS or carefully refine your backup policy to take snapshots at larger intervals. 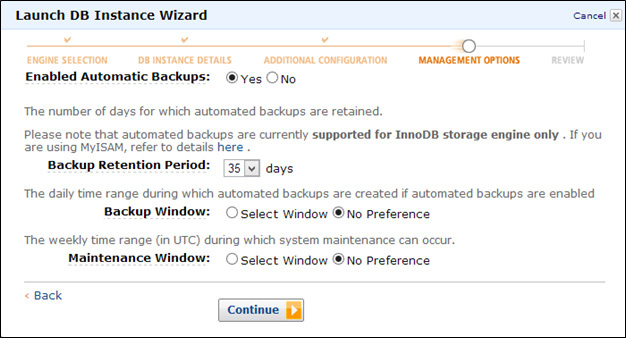 Automated backup allows you to recover a database in the same AWS region as the database. If you want to be certain that you are prepared for DR or migration by being able to automatically recover your database in another AWS region, you need to use manual snapshots. After taking a manual snapshot, it can be copied to the other region, where it can then be restored. Another important reason that manual snapshots are used is to allow users to survive database termination. In our experience, users run manual snapshots just before they delete an RDS instance. When you terminate a database, the RDS console prompts you to take a snapshot. In case of human error or breach, a snapshot might not be generated. If an RDS database instance is accidentally terminated and a manual snapshot wasn’t taken prior, the entire database and backup will be deleted because the automated backup data is part of the database transaction logs. As long as manual snapshots are taken regularly and kept secure, it’s easy to recover your database within a few minutes. Ultimately, you have to pay for the backup storage that you use until those backups are deleted. In order to really enjoy RDS manual snapshots, it is best practice to automate manual snapshots to serve your database backup policy. RDS snapshots can be taken and managed through the RDS console or via AWS APIs. You can also use tools that automate your RDS backup, like N2WS Backup & Recovery (CPM). CPM is a native cloud backup, recovery and disaster recovery solution for Amazon EC2 instances, EBS volumes, RDS databases and Redshift Clusters. It utilizes AWS EBS and RDS snapshots, directly connecting to users’ AWS infrastructure to perform automated backups.